ALL-CONSUMING DESIRE . . .
Izel Campbell was raised to believe she is an immortal Fionn with the magical skills of persuasion. But when she travels to Scotland to visit her ancestral home, Izel discovers that she is actually the world’s last living human. Forced to run for her life, Izel crosses paths with Kelvin Kerr, the Campbells’ greatest foe-and the most magnificent warrior she has ever seen. BURNS BRIGHTEST . . .
A thousand-year-old battle chief of the Kerr clan, Kelvin lives only to avenge his father, who died at the hands of the bloody Campbells. Honor demands he kill the Campbell heir, but when he learns that the lovely Izel is both Campbell and human, Kelvin is torn between duty and desire . . . The Darkest Day opens with a brief “history lesson” that highlights the long and bloody feud between the Campbell and Kerr clans. Kelvin Kerr vows to seek revenge on James Campbell for the death of Kerr’s father. We flash forward to the present where Kelvin is going to finish his vow to eliminate James’ son – the last heir of James’ lineage-until he finds out that “he” is actually a “she,” and Kel has a moment’s pause in his revenge plans. When he finds Izel Campbell, his intended target, he realizes she is possibly and probably also his fated mate. But what happens next is astonishing to both Kel and Izel – she undergoes a magical transformation, and they soon discover that she is the last surviving human on the planet. 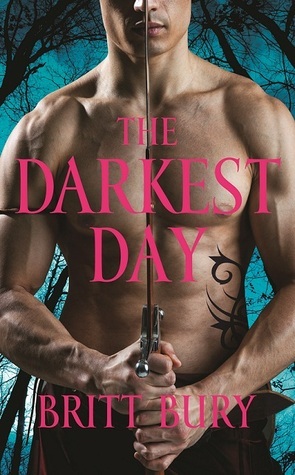 The opening of The Darkest Day was reminiscent of the movie, The Highlander…. Immortals fighting on a Scottish countryside. However, the flavor of the book altered quickly when I discovered that the heroine is the last remaining full human. In present day Earth, humans are extinct and Izel Campbell, heir of the Campbell Fionns, just discovered at age 25 that she is not a Fionn, but actually a full-blooded human. I love this twist. The opening few chapters are intriguing, a wonderful new mythology that had me racing to read more. Ms. Bury’s world is full of different immortal species, some of which are only mentioned in passing, but others such as the Fionns and Pookahs, are discusses in detail. Our hero, Kelvin Kerr is a Razorback Pookah, not a shifter, but a humanoid immortal that has animal “essence” as part of his being. The Kerr Clan (all Pookahs) and Campbell Clan (mystical Fionns) have been at war for over a century. Vengeful blood vows fuel the on-going feud and have created an unending battle, one that Izel is unaware of since her grandfather hid her in the US since birth. When she seeks out answers about her history from her grandfather in Scotland, she meets Kel, who keeps the truth hidden. They begin a journey together, one shrouded in deception (by him) and need (by her). Of course, the pair fall in love and the journey is not easy. Izel is strong and determined. She is cleaver and confused. Going from never having experienced feelings to meeting her very desirable, destined mate is jarring and the results are intense. She struggles to handle the severity of the ardent emotions, and I feel the results are believable. Kel is a huge alpha male, and oh is he delectable. He wants life to be black and white… All he’s ever known is honor and his family’s vow to rid the world of Campbells. When he realizes Izel is his fated mate, he struggles with “right and wrong,” and I hurt with and for him. Together, the pair is combustable. Kel and Izel are not opposites, but rather two different ends of the same wick – burning towards the center where they collide with explosive force. Every encounter they have is so passionate-beyond desire and into need. It’s easy to get swept up in their developing relationship. And HOLY HOTNESS!! Just Wowza! Their smexy time is sensual and lustful. And it’s not just passion and lust… the emotional growth and raw feelings the two experience are powerful. I had tears in my eyes at the pain both felt has they attempted to maneuver through the life-altering changes occurring to and around them. Ms. Bury does a marvelous job of getting the reader inside the hearts and minds of her main characters. As for the other characters: there are a slew of supporting cast that are ripe for further development. My favorites are Ian, Kel’s brother and Ramsey, a high-ranking Fionn warrior. Ian is very similar to Kel-trying to adjust perspectives when all he’s known is duty and honor. He too is attracted to an unexpected female “complication,” and I feel his story will be a good one when told. On the other hand, Ramsey acts as Izel’s best buddy, telling her like it is and helping her through her grief. His humor is sharp, but underneath it all he’s a teddy bear. He almost comes off as the “gay best friend” to Izel, but you can tell there is so much more to Ramsey. In conclusion, I really enjoyed The Darkest Day and eagerly await the next book. Ms. Bury has created a world full of adventure, excitement and romance. I fell for Kel and Izel from their first exchange, and their passion kept me engaged and engrossed. The plot and her mythology had a comfortable feeling, yet it is unique and exciting. Although I felt the ending was a little tidy, it didn’t detract from my enjoyment. Ms. Bury’s debut is a must read for paranormal romance fans! I really like this one. Looking forward to this series!!! Damaris: I hope you love it as much as I did! Vanessa: Have you posted a review? I’ll have to stop by and look. Mandi: I am right there with you! What a wonderful review and a story I can’t wait to read! I just put it on today’s growing shopping list! Thank you for sharing your thoughts!